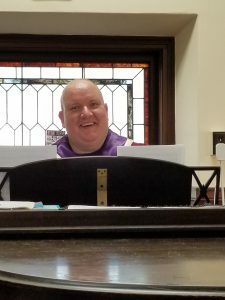 Last July, I blogged about my spring experience as an alto ringer with First Church of Nashua. Joe Olefirowicz, Minister of Music, has built a sensational music program at First Church, and I always enjoy working with him, either as a soloist or a ringer in the choir. 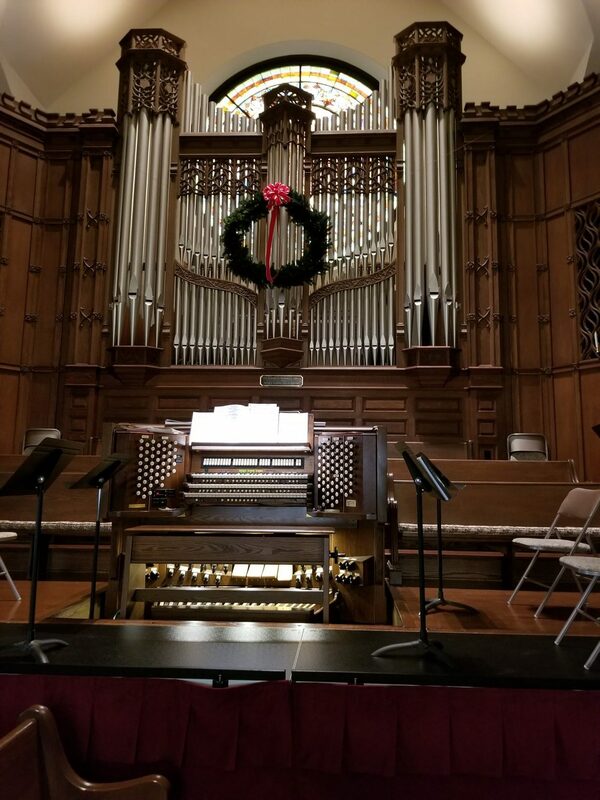 Recently, I had the pleasure of performing both services on November 26, Christ the King Sunday, which was the last Sunday prior to Advent. 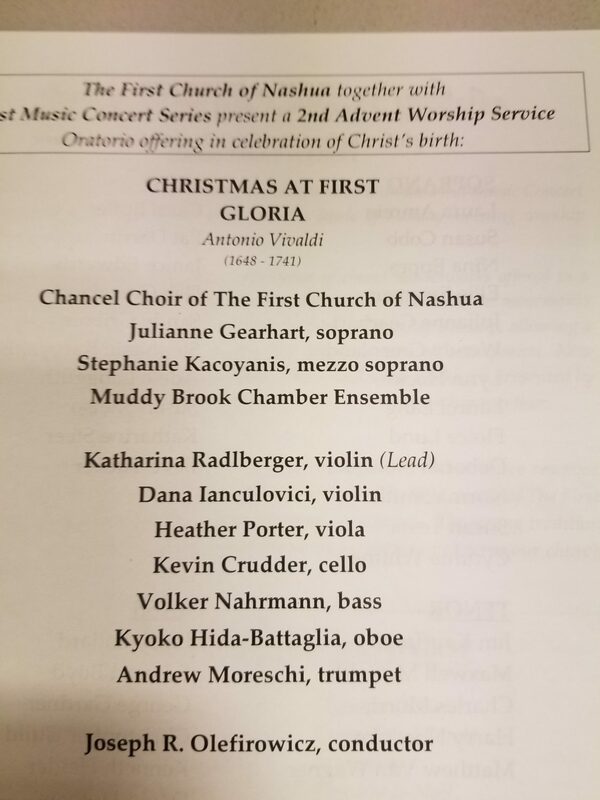 The two pieces I performed were “The Call” from Vaughn-Williams’s Five Mystical Songs , and Gounod’s gorgeous “O, Divine Redeemer”, which is more or less an opera aria. The First Church main sanctuary is very impressive, and Joe had me situated just by the organ, but close to the edge of the choir platform, so that my voice resonated up to the huge domed stained glass window. It was really thrilling to “let go” and hear my voice reverberate in that beautiful, resonant space. And of course, accompanied by Joe’s beautiful playing. 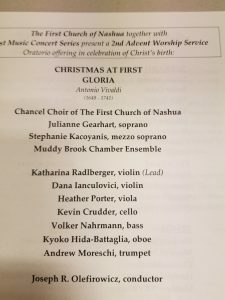 I was also invited to “ring” two weeks later when the choir presented Vivaldi’s Gloria as part of the morning worship services, and a part of the “Christmas at First” series. Here is a link to a wonderful performance by the University of North Texas Collegium Singers & Baroque Orchestra Richard Sparks, conductor. I could very well have sent you to John Elliot Gardner’s professional recording, but there is something so youthful and inspiring watching and hearing these fine young voices enjoying themselves so much. The soloists, not named on YouTube, are also excellent. Joe assembled a professional chamber orchestra (2 violins, viola, cello, double bass, oboe and trumpet), as well as two very fine soloists, Julianne Gearhart (soprano) and Staphanie Kacoyanis (Mezzo-Soprano). Their voices blended quite well in their duet, Laudamus te. Joe’s conducting style is very clear – one doesn’t need to worry about entrances or cutoffs because his cues are spot on and precise. Amazing how he managed that while conducting the orchestra AND playing continuo! 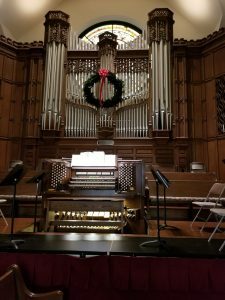 I was certainly in a Christmas mood after singing this joyous music.